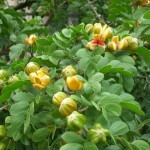 Guaiacum sanctum (Holywood Lignum vitae) - Richard Lyons Nursery, Inc. 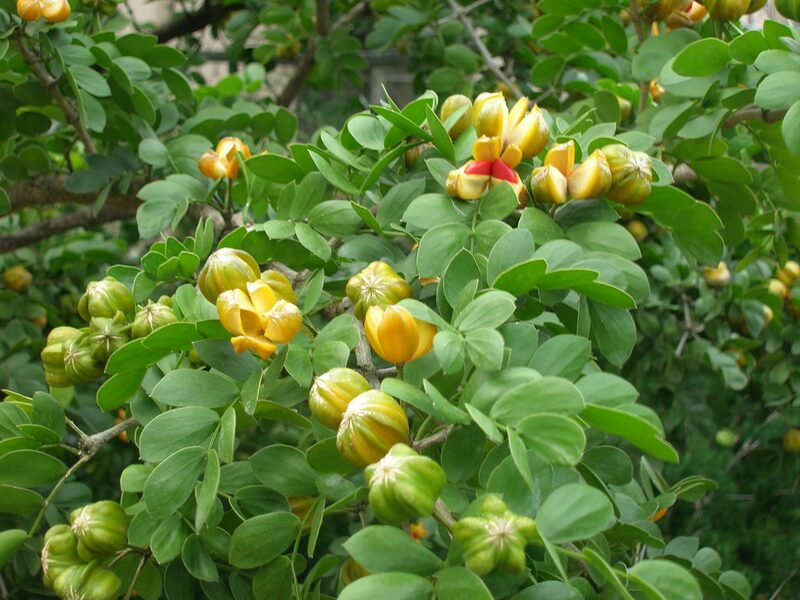 Most people know Guaiacum sanctum simply as ‘Lignum vitae,’ but its true recognized common name is actually ‘Holywood Lignum vitae.’ The basic two-word term Lignum vitae is somewhat misleading, because it applies not only to G. sanctum, but also to other species of Guaiacum. 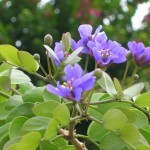 G. officinale is the Roughbark (or Common) Lignum vitae. 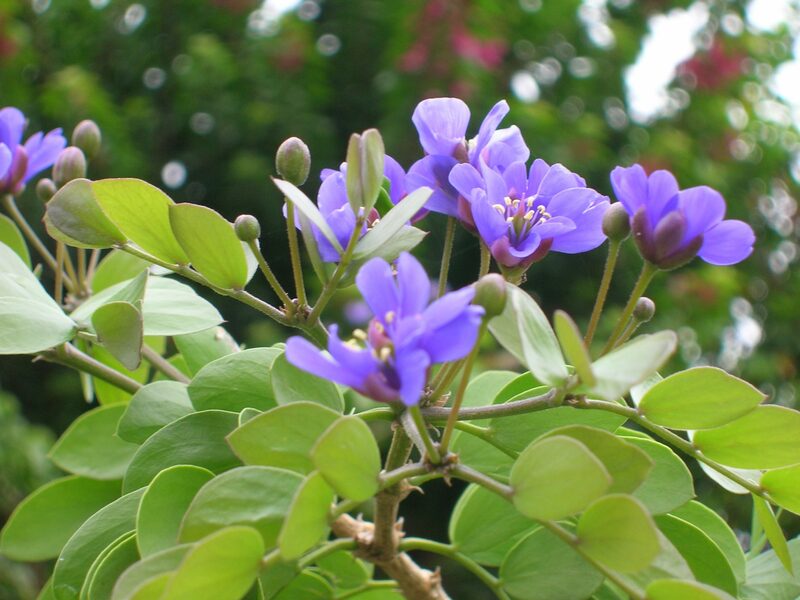 ‘Lignum vitae’ is Latin for ‘Tree of Life,’ and it was applied to Guaiacum because of the plant’s medicinal properties. For instance, it produces a resin which induces sweating. 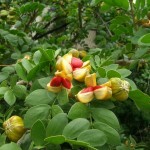 It has also been used to relieve gout and rheumatism, and as an anti-inflammatory. It has even been said, perhaps in hushed tones, that an extract of the tree cured Columbus of syphilis. And he told his mom that he was spending all his evenings studying nautical charts. Naughty boy. The wood of G. sanctum is striking for its greenish-brown color and for having a specific gravity greater than that of water, causing it to sink when placed in water. It is, in fact, the hardest of the trade woods. Because of its dense, strong properties, it traditionally has been used as a material for ship propeller shafts, mallets, caster wheels, and chisel blocks. Fortunately, the development of synthetic substances has eased pressure to cut down G. sanctum for its wood. 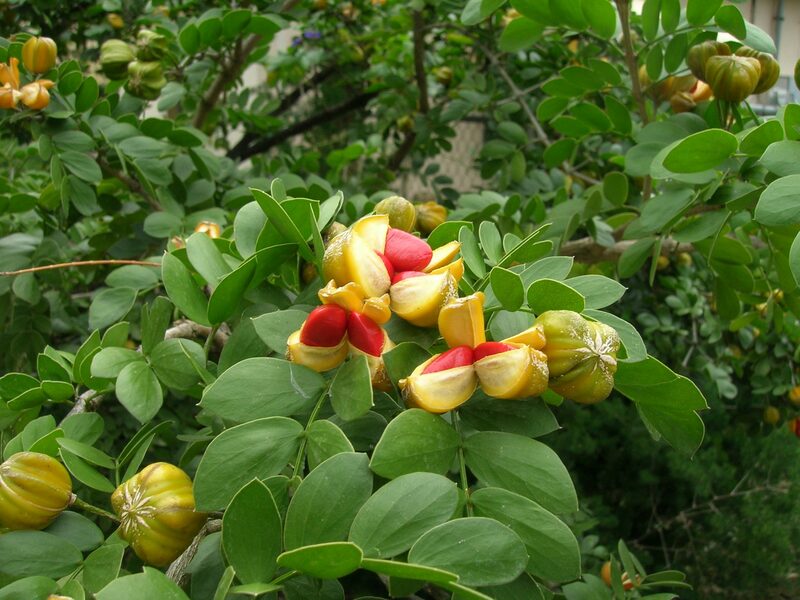 This tree is native to Miami-Dade County and the Florida Keys, and its range extends to the Caribbean Islands, Mexico, and Central America. It is considered endangered due to habitat loss and over-harvesting for its wood. Lignum vitae is a member of the creosote bush family, Zygophyllaceae. It produces deep blue to purple five-petal flowers from March through August. It develops orange-yellow seed pods which split open, revealing a bright red skin (aril) covering a black seed. Flowering and fruiting can occur simultaneously. The seeds are often consumed by birds, and the tree is the major food source for the caterpillar of the Lyside Sulphur butterfly. As might be expected of a dense-wooded tree, G. sanctum is an extremely slow-growing species. It produces multiple trunks which create a rounded crown. While the tree has the capacity to reach 30-40 ft. in height, due to over-harvesting it is rare to see specimens anywhere close to that size. Because of its lethargic growth rate, many nurseries do not stock G. sanctum. However, it is available at Richard Lyons’ Nursery in 1-, 3-, 7- and 15-gal. containers, as well as field-grown.